When I die I want to be stuffed and propped up at a table at this place wearing a Quins shirt. And if possible a fresh pint of Naked Ladies to be placed in front of me each day. Small pub with a couple of rooms. Very busy on summer weekends especially when the sun is out. Food ok but pricy but you get what you pay for. Beers well kept. Londons Pride was V good and two other real ales on tap. My son said lager was perfect. Staff do there best in serving when it is busy however they do and it was very noticeable on my three visits within 6 weeks that they serve locals before guests/tourists by a long way. Untrained staff or just looking after the regulars?? I've been a couple of times in the last month, and it really is the perfect summertime pub. On a sunny day, there is no better place to get slowly plastered right on the riverside. The beer is fine - I don't know why people say there could be more variety. It always has London Pride, then there are three or four other decent real ales to choose from. The food's OK. Not perfect, but not bad. The pub is modern inside but hasn't been modernised in an obtrusive way. Given its location on a very quiet road, right by the river, overlooking a wooded island, I can't think of anything to improve the place. I'm surprised at the 6/10 score for this admittedly small but charming riverside pub. Knocks spots off the Barmy Arms. Usually has Naked Ladies on and I've only ever found the staff friendly. Could do with more beer variety I suppose but never had a duff pint. With the sun out it's hard to beat the location with plenty happening on the river. 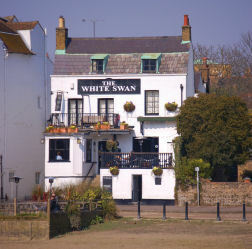 A unique pub in a unique location; off a residential road directly overlooking – and with direct access to – the River Thames. A detached, open aired enclave provides succour in the summer; there are fireplaces providing warmth throughout the winter. In any case, the meagre size of this establishment could mean you'll struggle to find a seat, although there's always the pavement.